Feline Immunodeficiency Virus effects the body’s ability to develop a normal immune response to disease and infection. It is similar to Human Immunodeficiency Virus (HIV) but neither virus can be transmitted from Human to cat or visa versa. A cat with FIV may not show symptoms until years after the initial infection. Once the virus takes hold, the cat’s immune system is severely weakened and she becomes susceptible to secondary infections. A cat may appear healthy with periods of illness or progressively become ill. If your cat shows any of the following symptoms, get him examined by your vet. Many of these symptoms are also an indication of Feline Leukaemia (FeLV). FIV is most commonly transmitted through a cat bite but can also be caught from an infected mother cat by her kitten, sharing food bowls and litter trays, grooming, sneezing and mating behaviour. Male outdoor cats are most at risk as they are more likely to get into fights and be bitten by an infected cat. How is FIV in my cat diagnosed? 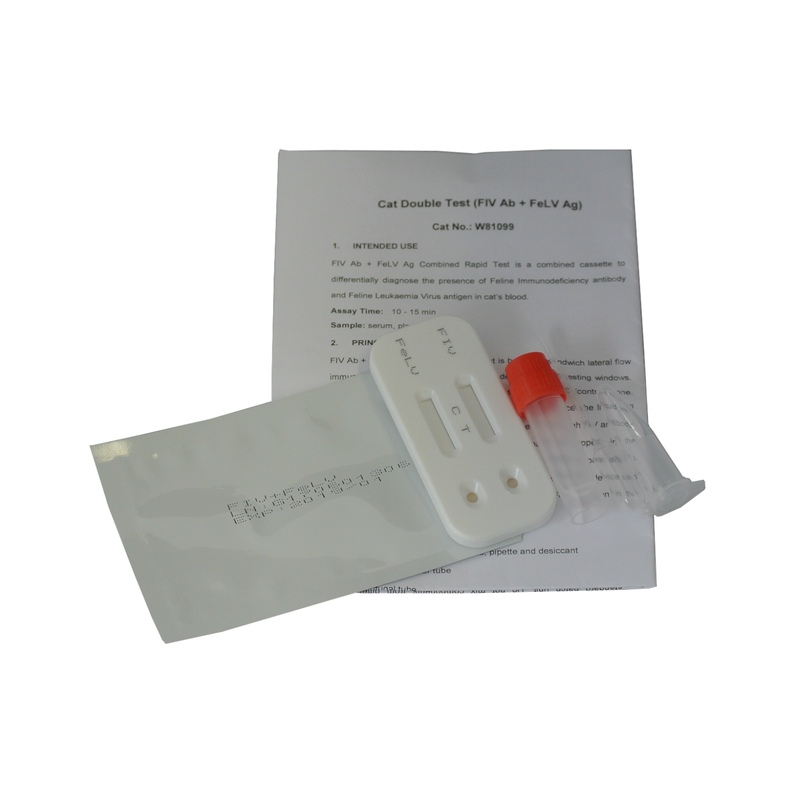 As the symptoms of FIV are very similar to FeLV (feline leukaemia), initial diagnosis is made via a blood test. If a positive result for FIV is received, your vet will want to rule out any other bacterial, viral or fungal infections and will test for parasites (eg. fleas, worms) and tumours prior to final diagnosis. The vet will also undertake a complete blood profile including a chemical blood profile, blood count and urine analysis. It can, however, take up to 12 weeks from catching the virus, before it can be detected in the blood, it is therefore sensible to wait 3 months, from possible infection, before testing for the virus. If a kitten of an infected mother tests positive, it is possible that by 6 months it may have cleared the antibodies from their systems. It is, therefore, necessary to retest a kitten after this period to see if they are infected. Unfortunately, there is no specific treatment for FIV. The virus can be carried for a long time before symptoms set it. In these circumstances, treatment will focus on keeping the cat well with a healthy diet and, possibly, immune enhancing drugs, although these drugs are rarely effective so not often an option. If a cat starts to show symptoms, usually from a secondary infection, your vet will prescribe treatment and medication to elevate those symptoms. What are the long-term effects of FIV? When a positive diagnosis for FIV has been given, your vet will advise you on your cat’s long term care. Due to the effect of FIV on your cat’s immune system, you will be advised to keep your cat indoors to avoid contact with other diseases and developing any secondary infections. This will also protect any other cats from becoming infected. Your cat will need regular check ups, at least twice a year, when your vet will look at your cat’s general health and take a blood count test and urine analysis. You should also expect to receive advice on nutrition, including which foods to avoid, parasite control and inoculations against other diseases. Watch for any changes in your cat’s health and behaviour. Prompt and proper treatment of any secondary infections can help prevent a life threatening condition. With proper care, most cats can expect to have a normal life expectancy, although, in addition to secondary infections, they are prone to developing certain types of cancer. How can I prevent my cat from developing FIV? Your cat should be vaccinated against FIV and, where possible, protected from coming into contact with other cats, particularly with those that are FIV positive. New cats coming into your household should be quarantined and tested for the virus, if not previously vaccinated. It should be noted that cats which have been vaccinated will test positive for FIV, due to the antibodies produced as a result of the vaccine, even though they do not carry the disease. The virus is most often transmitted via saliva following a bite from an infected cat. As unneutered male outdoor cats are more aggressive and territorial they are more likely to get into fights with other cats. It is, therefore, advisable to get them neutered.